This brief gives an overview of projects CRIDF has engaged with in South Africa, with particular focus on the impacts of the projects for basin communities. 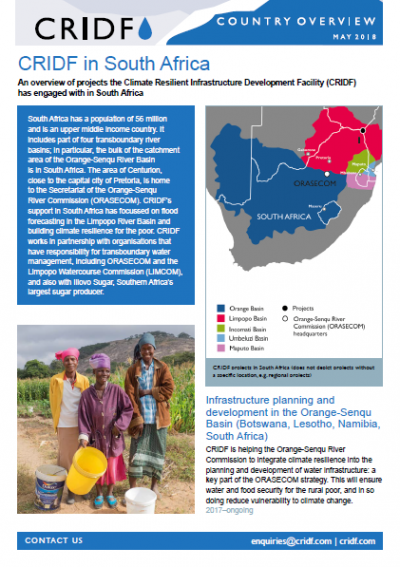 CRIDF works in partnership with organisations that have responsibility for transboundary water management, including ORASECOM and the Limpopo Watercourse Commission (LIMCOM), and also with Illovo Sugar, Southern Africa’s largest sugar producer. CRIDF’s support in South Africa has focussed on flood forecasting in the Limpopo River Basin and building climate resilience for the poor.